FB Series ball valves use a unique combination of features to provide leak-tight performance at high and low pressures and temperatures, high cycle-life, low maintenance, low actuating torque, and configuration flexibility. LFB low-temperature ball valves are designed with materials selected for applications requiring temperature ratings from -40 to 200°F (-40 to 93°C), pressure ratings up to 6000 psig (414 bar), and flow coefficients up to 13.8. FB Series ball valves are very versatile. They can be used in both high and low pressure instrumentation systems, process lines, utility systems, and other applications. Designed for higher pressures than many floating ball valves, they can be used in applications such as high-pressure CNG filling station supply lines, equipment and in instrumentation and control systems. Unlike many floating ball designs, FB Series valves are also suitable for low and dynamic pressure conditions. In addition, end-screw construction allows users to specify a wide variety of end connection size and type combinations. SSP offers three tube fitting designs. Duolok two-ferrule tube fittings are standard. To select a different design, select the designator from the table below, then substitute it for the “D” in the part number. Example: 36PU4-316 for Unilok tube fitting end connections. Factory installed locking handle hardware can be added to any size valve by adding -LD to the part number. Example: 38PD8-316-LD. Locking handle kits for field installation can be ordered using the part numbers in the table below. Actuator brackets and couplings are available for ISO 5211 compliant actuators. Actuator kits contain the actuator bracket, coupling and fasteners required to install the actuator bracket and connect to the actuator. Rebuild kits can be ordered using a part number from the table below. STEM AND SEAT KITS: Stem and Seat rebuild kits contain stem o-ring, stem back-up ring, stem chamfered back-up ring, stem bearing, packing bolt gasket, seats, seat backup rings, seat o-rings, seat springs, end screw gaskets, lube, MSDS and instructions. All FB Series valves are factory tested with Nitrogen to 1000 psig (69 bar) at 70°F (20°C). The Part Numbers and Dimensions tables contain only the most popular valve configurations; many more are available. If the required valve configuration is not in the Part Numbers and Dimensions tables, use the chart below to build part numbers for quotation purposes. 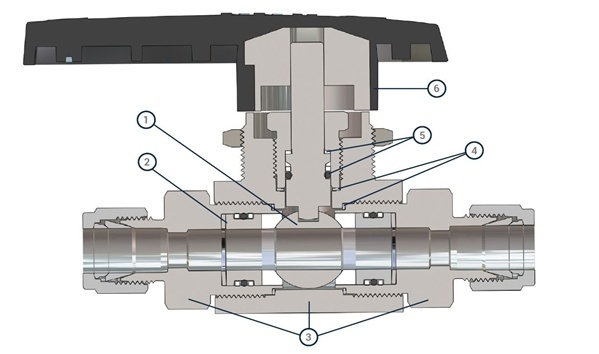 End screw construction allows virtually unlimited configurations to meet the specific requirements of an application. Examples include, but are not limited to, end types such as hose barbs, tube stubs, and ISO straight thread. Please contact SSP customer service at customer.inquiries@mySSPusa.com or 330-425-4250.